Throughout much of recent world history, Asia has been a crucial continent for paleontology. Fossils uncovered from Asia have been incredibly important for hominid, dinosaur, ichthyosaur, and mammal research, and, especially in the past few decades, new discoveries are being reported all the time. One of the earliest paleontological discoveries from Asia was from the island of Java in the late 19th century. Three fossils of a hominin were recovered by Eugène Dubois, a Dutch paleontologist. These specimens, dubbed the Java Man, represented one of the first discoveries of Homo erectus from Asia, and supported one of the theories of hominid origins at the time, that our origins came from Asia. Later, in the 1920s, American paleontologist Roy Chapman Andrews delved into the Gobi Desert of Mongolia and China, discovering some of the most famous faces of dinosaur paleontology, including Velociraptor mongoliensis, Oviraptor philoceratops, and Protoceratops andrewsi, as well as otherworldly mammals like the huge Baluchitherium grangeri(now Paraceratherium transouralicum) and the enigmatic Andrewsarchus mongoliensis. The type specimen of Velociraptor mongoliensis, discovered by Andrews. Photo by the author. Just south of the Mongolian expeditions, in Beijing, another huge development in Asian paleontology was occurring. At Zhoukoudian, in one of the biggest moments of Asian anthropology, the remains of the Peking Man were discovered. Work here, similar to the Gobi expeditions, was also led by a Westerner, this time the Canadian Davidson Black. The Peking Man stands guard at the entrance to the modern day Zhoukoudian. Photo by the author. And further south, Austrian student Otto Zdansky(who had also found the first Peking Man remains) discovered a plethora of mammals from Shanxi, including what would later become known as the machairodont Yoshi minor. During this time, Zdansky also excavated two skeletons of the first dinosaur to be scientifically researched from China, Euhelopus zdanskyi(although not the first described, beaten by Mandschurosaurus, described in 1925 by Russian researchers). As time went on, however, and the situation in Asia started to fall into political strife, Western researchers left. Eastern work, however, continued, particularly in China. In the 1930s, even in the midst of the Chinese Civil War and the Second Sino-Japanese War, Chinese scientists came to the forefront of the scene, with Yang Zhongjian(more popularly known as C. C. Young) leading dinosaur research. During this period, the Jurassic sauropodomorph Lufengosaurus was described, and it became the first skeletal mount of a dinosaur to be put on display in China. 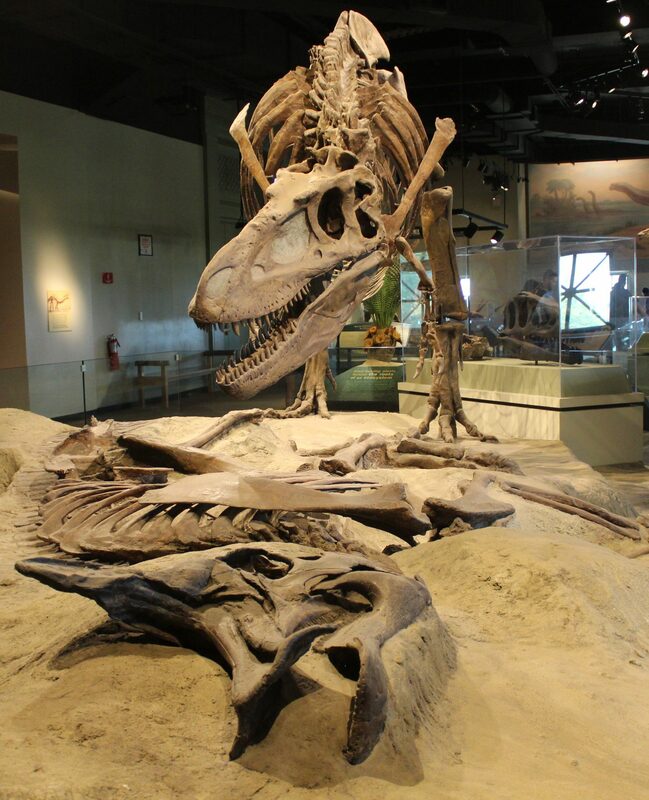 Into the mid 1900s, work by Yang continued, as new dinosaurs like Mamenchisaurus and Tsintaosaurus continued to emerge, and Triassic deposits started to yield taxa such as Shansisuchus. Back in Mongolia, however, paleontological work began another round, reaping the fruit of the Gobi. Soviet expeditions from Russian and Polish researchers unearthed many new dinosaurs from the Nemegt Formation, including Tarbosaurus bataar, Therizinosaurus cheloniformis, and Gallimimus bullatus. As the 20th century came to a close, a revolution then occurred in Northeastern China. Non-avian dinosaurs were discovered with feather and filament impressions, and even full wings. The Jehol Group of Liaoning soon yielded a mass of these immaculately preserved fossils, and new finds are still being made at a great pace today. Other localities with preservation similar to that of Jehol soon popped up in Hebei and Inner Mongolia. In much more recent years, spectacular fossils have also been found in other parts of Asia. In the Amur region of Russia, intriguing hadrosaurs have been discovered from Latest Cretaceous deposits. In Siberia, the ornithischian Kulindadromeus was discovered, preserved with a coat of filaments, throwing dinosaur integument evolution into chaos. And from Southeastern Asia, Burmese amber from Myanmar has preserved unimaginable things, from a feathered dinosaur tail to avian wings. Asia has been a hotspot for paleontology for a century, and it continues to be a major point of interest for paleontology today. It only makes sense that magnificent specimens are displayed in their fossil halls, and that their museums are being built and becoming more modern at a pace faster than ever before.